Putin: You buy our Bonds, we buy your Gold, Da? This confirms our intuition last month when Bloomberg and other media firms were crowing about the high demand for Russian Bonds. We asked, "Where is that money going?" And separately we had already asked: "How can a country like Russia with a tight currency reserve supply buy so much Gold? With your money, seems to be the answer. Essentailly, Russia which has defaulted 5 times and has been in that state for 10 of the last 26 years just sold a bunch of hedge funds, pensions and "smart" people bonds. Some if not all the proceeds at the governement level went to buy Gold. Gold was unavialable for comment, but has yet to default as far as we know. Russia has been a large buyer of Gold in recent months/ years.Where do you think they got the money to buy the Gold despite dwindling currency reserves? Here is one source. The connectivity and custody trail are not vouched for below to be fair. This is an illustration of cash flows. And we are not talking conspiracy, just economics. One thing is certain. Russia, and any government in the position to, are selling paper and buying real assets as fast as they can. And the public will be left holding the bag.- Soren K.
"Da, we will take 300,000 more just like this." According to IMF (International Monetary Fund) data, China and Russia account for nearly 85% of gold purchases by central banks over the past two years. It was a move to diversify reserves as demand from other central banks declined. According to the World Gold Council, Russia’s gold reserves increased by 45.8 tons in 1Q16. That was 52% higher than 1Q15. As Louis Cammarosano of Smaulgld reports: From January 2016 through August 2016, Russia has added over 110 tons of gold to reserves.August’s gold addition brings Russia’s gold holdings to over 1,527 tons; the sixth most of any nation. How Does Russia Finance It's Gold Purchases? 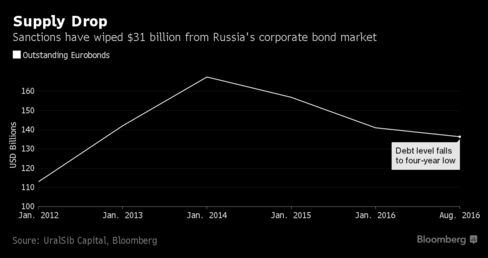 Russia and Russian corps are selling bonds to the public backed by the Ruble. And (on our conjecture) taking the proceeds to eventually buy Gold. Russian public "gets it's F-ing face ripped off"
Russian corporate bonds have become so scarce under sanctions they’re leaving yield-chasing investors desperate to buy more. Since U.S. and European penalties largely cut Russian issuers off from global financing in early 2014, the supply of hard-currency debt from companies has tumbled by $31 billion, or 19 percent, according to data compiled by UralSib Capital. That’s created a dearth of bonds for money managers seeking refuge this year from near-zero rates. Note the added irony where Bloomberg actually uses "Gold Dust" to describe the Russian Bonds. *** why not just buy gold dust? How is Russia's Track Record on Debt? From former Central Banker and architect of the Weimer Republic's Hyper-Inflation, Rudy Havenstein: He was the first of his kind, expert on Monetizing debt, understood the value of Gold and not without a sense of humor. How has the Ruble faired? Worst paper asset in a 20 year paper bull market. Russia, China and we suspect any economy that can is preparing itself for the next monetary reset in which Gold and Real assets will figure to be a major part, if for no other reason, the cyclical nature of things. Remember the book Liar's Poker wherein the French are lambasted by a character called the "Human Piranha"? They sold bonds that converted into Gold and got destroyed. Here is the excerpt that makes us laugh every time. And is the direct opposite of what is happening now. If Trump Wins, Buy Gold, Sell Stocks- CitigroupMSM Treats Gold like "Asset for Deplorables"